In the small town of Ibaraki, 25km outside of Osaka, Japan, stands one of Tadao Ando’s signature architectural works, the Church of the Light. The Church of the Light embraces Ando’s philosophical framework between nature and architecture through the way in which light can define and create new spatial perceptions equally, if not more so, as that of his concrete structures. Completed in 1989, the Church of the Light was a renovation to an existing Christian compound in Ibaraki. 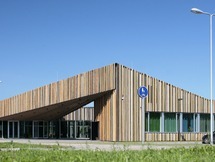 The new church was the first phase to a complete redesign of the site – later completed in 1999 – under Ando’s design aesthetic. For Ando, the Church of Light is an architecture of duality – the dual nature of [co]existence – solid/void, light/dark, stark/serene. The coexisting differences leave the church void of any, and all, ornament creating a pure, unadorned space. The intersection of light and solid raises the occupants awareness of the spiritual and secular within themselves. 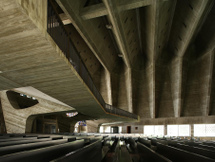 The employment of simplistic materials reinforces the duality of the space; the concrete structure removes any distinction of traditional Christian motifs and aesthetic. Besides an extruded cross from the east facing façade, the church is composed of a concrete shell; the concrete adds to the darkness of the church by creating a more humble, meditative place of worship. As a testament to minimalist architecture, the crosses void in the east facing wall is the only prominent religious symbol present in the church. Formally, Ando’s Church of the Light is minimalist and reductive of religious paraphernalia to a simple cruciform extrusion, which is often criticized as disturbingly empty, void, and undefined. Although it has been stated to be nothing more than six walls and a roof, there is a whole level of design aesthetic implemented by Ando and his contractors that is misread and unrecognized by the occupants. As a modern, minimalist structure the Church of the Light emits an architectural purity that is found in the details. The reinforced concrete volume is void of any and all ornament that is not part of the construction process. The seams and joints of the concrete are built with precision and care by master Japanese carpenters, along with Ando, that have worked to create an immaculately smooth surface and accurately aligned joints. So much so, that the seams of the concrete formwork align perfectly with the crosses extrusion on the east side of the church. The concrete construction is a reinforcement of Ando’s principal focus on simplicity and minimalist aesthetic; however, the way in which the concrete is poured and formed gives the concrete a luminous quality when exposed to natural light. Ando’s decision to place the cross on the east façade allows for light to pour into the space throughout the early morning and into the day, which has a dematerializing effect on the interior concrete walls transforming the dark volume into an illuminated box. Ando’s approach to light and concrete in the Church of the Light, as well as his other projects, has a surreal effect that perceptually changes material into immaterial, dark into light, light into space. The church has an area of roughly 113 m² about the same size as a small house. The church was planned as an add-on to the wooden chapel and minister's house that already existed at the site. The Church of the Light consists of three 5.9m concrete cubes (5.9m wide x 17.7m long x 5.9m high) penetrated by a wall angled at 15°, dividing the cube into the chapel and the entrance area. One indirectly enters the church by slipping between the two volumes, one that contains the Sunday school and the other that contains the worship hall. The benches, along with the floor boards, are made of re-purposed scaffolding used in the construction. It took more than two years to complete. The delay in completing the work was due to problems in raising the necessary funds. Initially it was feared that it would cost more than the budget and Ando even considered building it without a roof, but the construction firm donated the roof and this became unnecessary. Obra excepcional, que permite hacer sentir, al hombre. De la grandeza de Dios.